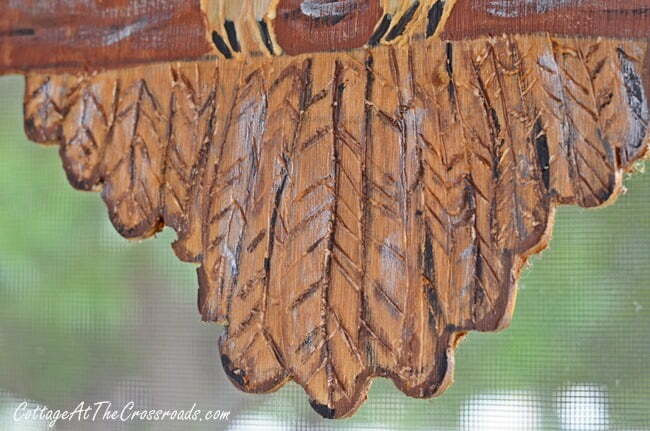 You are here: Home / DIY / Using a Dremel is a Hoot! Using a Dremel is a Hoot! Can you believe August is over and fall is just around the corner? Even though it’s still hot as blazes here, Leo and I have completed our first fall project, and here he is! It’s Mr. Hooty Hoot! He has perched himself here on the front porch and is lending a little fall flair to our home. Just in case you might like to make one of your own, I’m showing the steps we used in creating him. 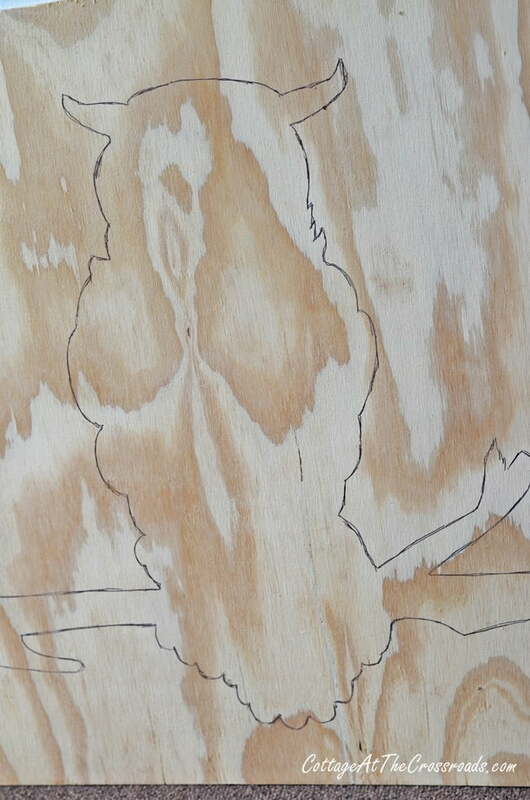 Using an image of an owl I found online, I roughly sketched the outline of the owl and a branch on a 28″ X 28″ piece of 1/4 inch plywood. Then Leo’s brother Jim used a variable speed jigsaw (pictured on the right) to cut out the outline. Using a pencil, I added some details to the cutout. I went back over some of the details with a Sharpie, but I wouldn’t advise that! Then Leo used the Dremel 3000 tool and several small engraving bits to carve out the details. Then he handed the owl over to me and I stained him all over, front and back, with golden pine gel stain by General Finishes. Using a gel stain is so much easier than a liquid. You just wipe it on and then wipe off the excess. 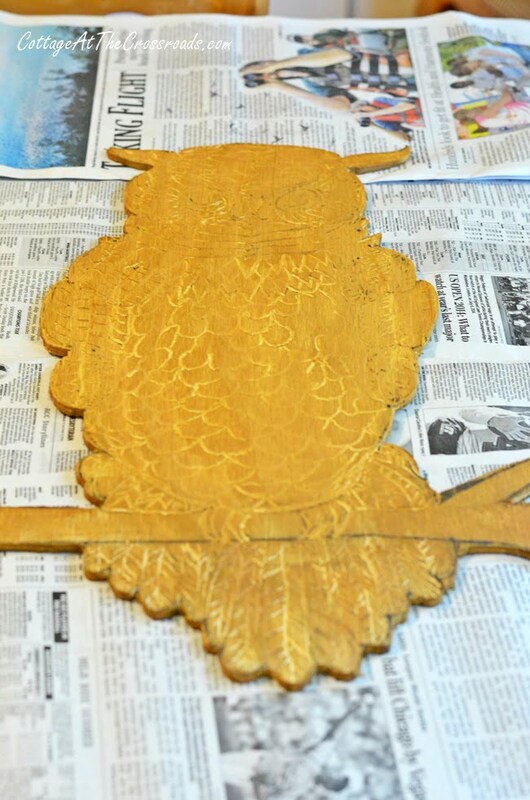 After the stain had dried, I used some brown, black, grey, white, and yellow-gold to highlight the carved out features. 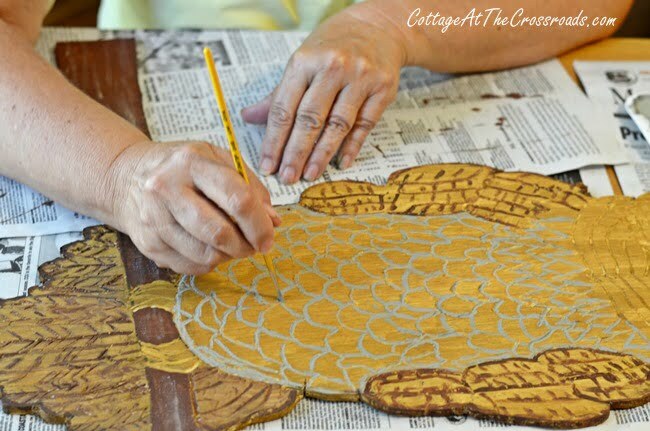 You can see how using the Dremel tool to carve out the details and then adding the paint really adds some interest. 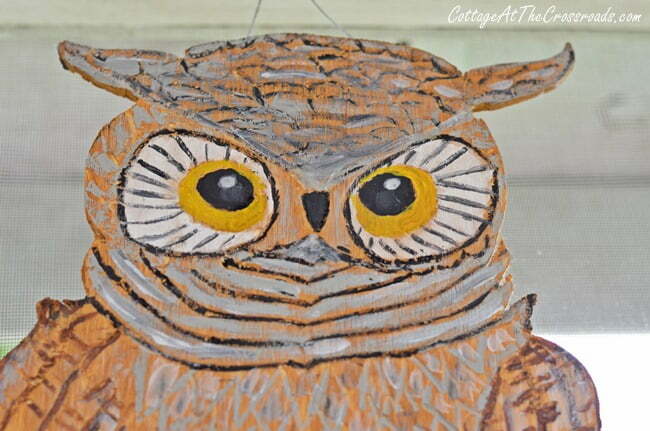 Mr. Hooty Hoot is waiting on more owl friends to join him on the porch as summer gives way to fall. Stay tuned to Cottage at the Crossroads for the next exciting episode of ” The Fall Front Porch” where you’ll find the answer to the question just how many owls can you fit on a front porch? 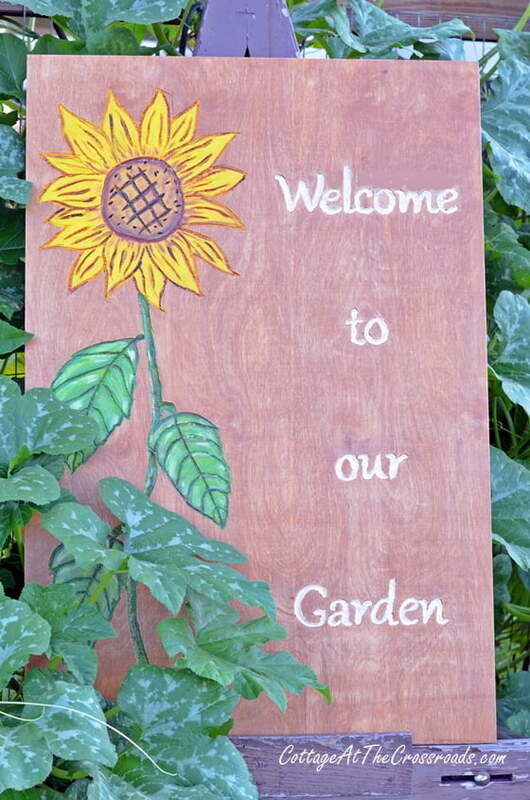 Our Wooden Garden Sign made with a Dremel and our wooden owl have been featured over at Dremel Weekends, a great site for finding all sorts of DIY projects you can do with a Dremel. 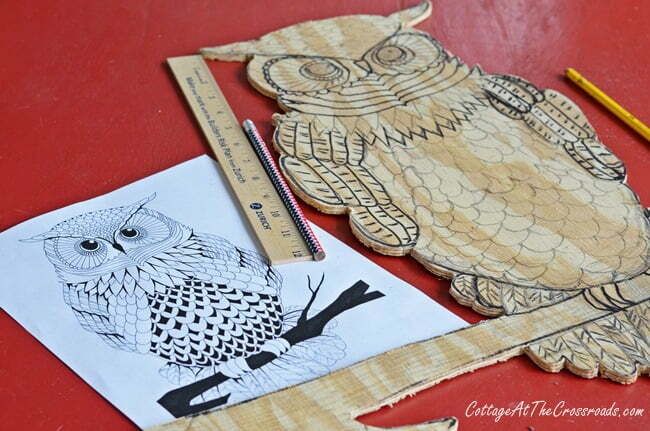 Wow, great job on the charming owl!! That is one cute owl. What a fun project! 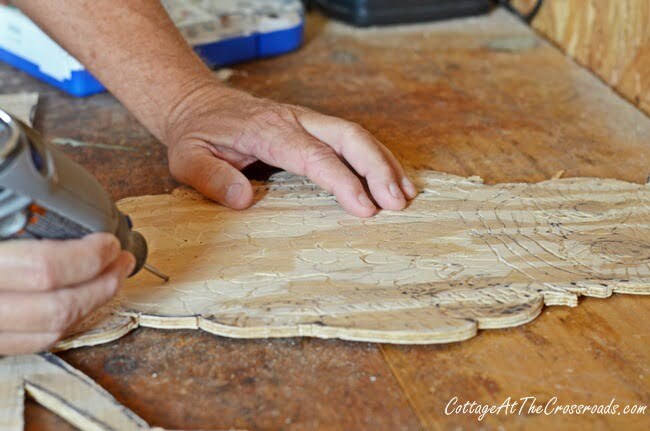 Wow…I love it…always wanted to try my hand at a Dremel!! !…Great, great job! 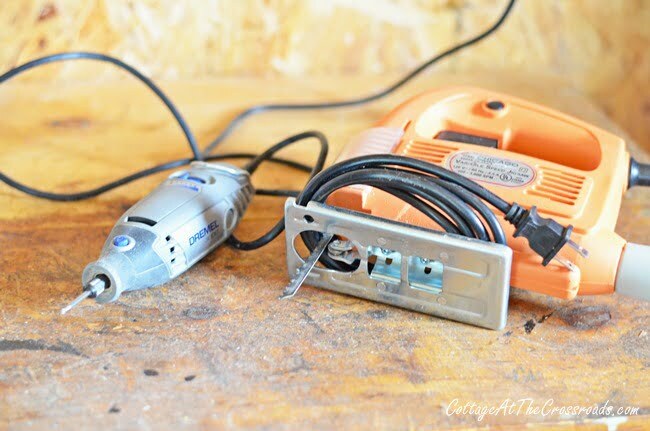 I have always wanted to learn how to use a dremel ! Thanks for another great post! 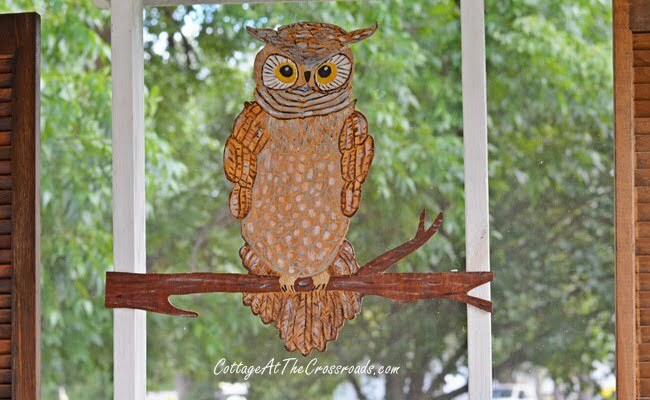 Jane, Your owl is too cute perched on your porch! 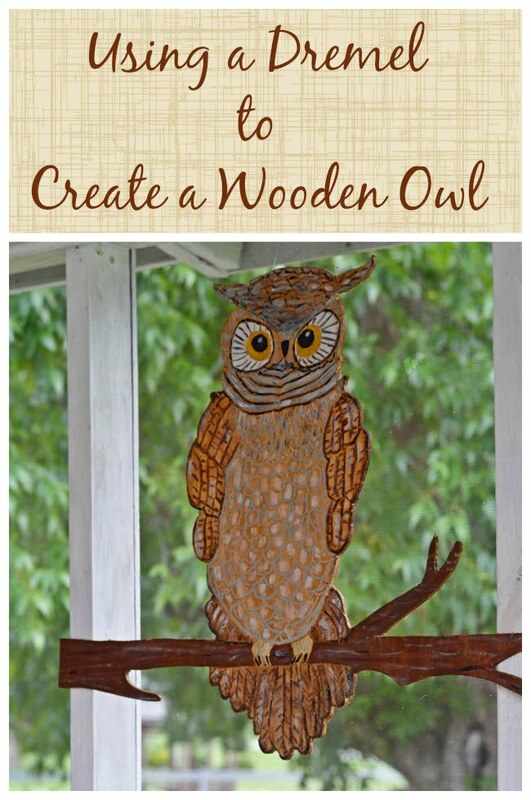 Whoooo knew you could create one with a Dremel?! I was just reading Kathleen’s comment above and your response. So funny how the Mason-Dixon line divides folks about fall. It can’t come soon enough for the me with the humidity and heat creeping back up this week. Jane and Leo, this is fabulous! I love it. You can start a business making and selling these. Happy Labor Day, you two busy bees need a day to rest and recharge! No worries, Barbara! I took a 3 hour nap Sunday afternoon, and I NEVER nap! Happy Labor Day to you, as well! Whooo knew? Adorable. It’s not Fall Y’All, lol! After last winter I am holding on till the 22nd, when it is officially Fall! September is the most beautiful summer month here, tourists gone, water is at its warmest, and beautiful clear days. No rushing the seasons, after all , we are entering the winter stage of life! Yes, time sure passes quickly now, doesn’t it Kathleen! We don’t really have a fall here in South Carolina until late October. So we have to create our own fall! You’ve created a masterpiece! Mr. Hoot is quite the dapper fellow on your porch! Love it! Great directions and the owl turned out wonderful. You and Leo are quite the Dremel artists! I have tried to use one before but have never been successful! I am impressed! Jane, that is just too cute!! Happy Labor Day!